Continuing this month’s theme of diving career opportunities, today will focus on the Instructor Development Course Staff Instructor, IDCS. A Staff Instructor is like an assistant instructor for a Course Director. A PADI Course Director conducts PADI instructor-level training: Instructor Development Course (IDC) or it’s two sub courses, Assistant Instructor and Open Water Scuba Instructor and Specialty Instructor training. An IDC Staff Instructor can conduct almost all portions of an Instructor Development Course, under the supervison of a Course Director. Also, an IDC Staff Instructor can independently conduct the PADI Assistant Instructor course. 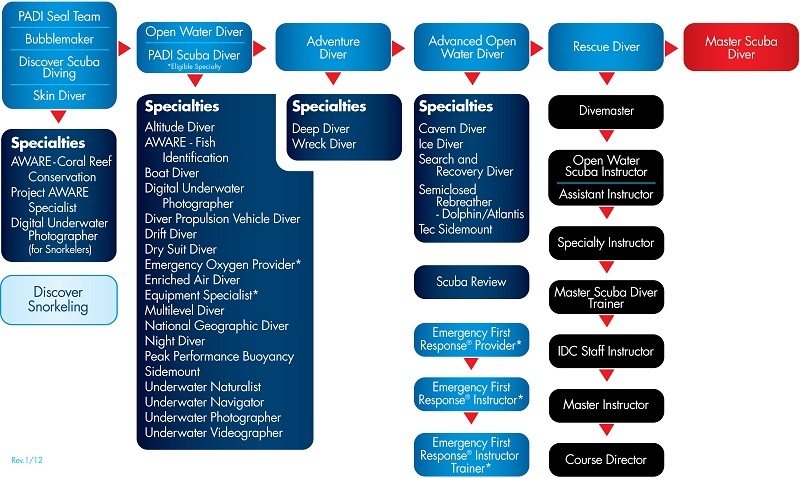 IDCS fits between the Master Scuba Diver Trainer and Master Instructor ratings in the PADI certification hierarchy. If you want to become a Master Instructor, you need to become a Staff Instructor first. So, why become a PADI IDC Staff Instructor? For me, initially it was just the next step to become a Master Instructor (more on Master Instructor in a future post). What I found out, though, as I progressed through the IDCS program is that I really enjoyed teaching new instructors. It became the logical next step: I’ve taught divers, now I start training the next generation of Instructors. Not what I’d intended, but like almost all other scuba training I’ve taken, it changed my life. I knew I was going to have to become a Course Director. What was it that was so life-changing? Two things spring to mind. First, working with a higher caliber of students. These were people whose lives had been changed and they were headed towards being an instructor. That’s still one of the many things that keeps me in the instructor-development business. Second, it was a complete refresh of my instructor knowledge with plenty of updates. Since part of the IDC Staff Instructor course is auditing a complete Instructor Development Course, I saw how the process had changed since I had become an instructor and I updated my knowledge of standards and how to teach. What goes into the IDC Staff Instructor course? Teach a classroom presentation, but it has to score higher than the minimum for new instructors. Take the same PADI Systems, Standards & Procedures exam, and pass with a higher minimum score. Perform a skill circuit, same as instructors & divemasters, but with more polish & higher scores. 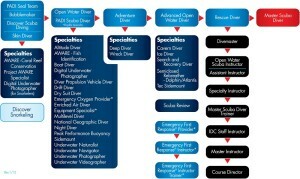 What I realized during my IDCS course is that I had to role model the complete PADI system. I had to know it inside-out, so I could explain not just the “how” but also the “why.” behind what we do. I’d been teaching for many years as an Instructor before I started down the road of Instructor Development. Revisiting the training, I saw it through different eyes. I remembered being stressed during my Instructor Development Course, I could empathize with the candidates. During my IDCS course, though, I wasn’t under that stress, so I could pick up on some of the details I’d missed or forgotten. If you’re headed towards Master Instructor or are eyeing Course Director, IDC Staff Instructor is a necessary step. Once you’re there, though, you will need to practice what you’ve learned. You need to actually staff Instructor Development Courses and/or train Assistant Instructors. Much like becoming an Instructor, the training prepares you, but you’ve a lot more to learn and you’ll learn it when you’re out teaching. After I became a Staff Instructor, I staffed three IDC’s, with three different Course Directors. I saw three different ways to approach the programs. I found things I liked, stuff I didn’t, and stuff I found I could tweek and make my own. That experience and stuff I continue to learn when I train new instructors helps me to continue to become a better instructor. So, are you ready to up your game? IDC Staff Instructor is calling for you, will you answer the call?